Winter strikes early for purveyors of handmade holiday gifts. It may seem premature to start preparing for the winter season with Halloween a month away – but Etsy sellers are already kicking it into gear. These tips will help you prepare for the upcoming months of heavy holiday traffic. 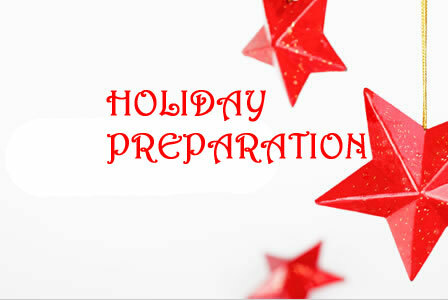 Stay tuned for additional holiday preparation tips on an upcoming Holiday Prep II. Start ordering your holiday supplies right away. If you’re struggling with how much to order, a good rule of thumb is to take your busiest month on Etsy for the year and double it. Be prepared to sell that much in October through December. Whether you use recycled boxes or brand new bubble envelopes, you’ll want to have plenty on hand. You don’t want to have anything delaying your packages from going out as fast as possible. Those free USPS boxes aren’t always available during the busiest shipping time of the year. Be creative and make a holiday line for your shop. You don’t need to carve dreidels or reindeer – you just need to make your items appeal to holiday buyers. Think gift sets or stocking stuffers. Buyers sometimes need a bit of help deciding on the perfect gift; show them that your products are just the thing. The worst (or best) scenario is that you’re so overwhelmed with orders that you can barely keep up. It might not happen, but it doesn’t hurt to be prepared just in case. Have some meals in the freezer for those days you’re too busy or too tired to cook. Delegate chores and obligations to other members of the household. Most importantly, know when to say “no” to housework (or orders). Keeping your sanity should be priority #1. Your family doesn’t want a Grinch around all season. Think of inexpensive and beautiful ways to offer gift wrapping in your shop. You don’t need to go over the top to let your customers know that you put in extra effort this holiday season. Is this your first holiday on Etsy or do you have years under your belt? Go ahead and tell us in the comments below.